First, an explanation. This happened. So things at MOC have basically been on hold for a few weeks. Life is now returning to normal. The following discussion has nothing to do with the above, other than the fact that my dad’s best friend wryly observed of him: “When he opened his wallet, moths flew out”. I suppose I share this trait with regard to a lot of things. But I do not scrimp on can openers. This is why. About 10 years ago when I was living in Montreal I was very poor, and outfitted my kitchen with items available from the dollar store. Including a can opener I paid exactly $1.14 for (in Canada, they hit you hard with sales tax). After taking this small financial hit, life was somewhat better. I could now eat canned Ravioli. However this state of affairs did not last long. Within the next week my $1.14 can opener had opened (poorly!) about three or four cans before flying apart while trying to pry open an 800 mL can of Bravo spaghetti sauce. So I was back to where I started: with no working can opener. This time around I decided I wasn’t going to screw around, so I went to the local Canadian Tire and pulled out $6.99 . It was more painful to do this, but the can opener I received was of superior quality. And it did not fail me in the subsequent years that passed (although it did get a tad rusty). Now what does this have to do with chemistry? Well, it resembles a situation that occurs in the addition of strong acids (like hydrochloric acid, HCl) to certain dienes such as butadiene. Two products are possible: the 1,2-product and the 1,4-product. 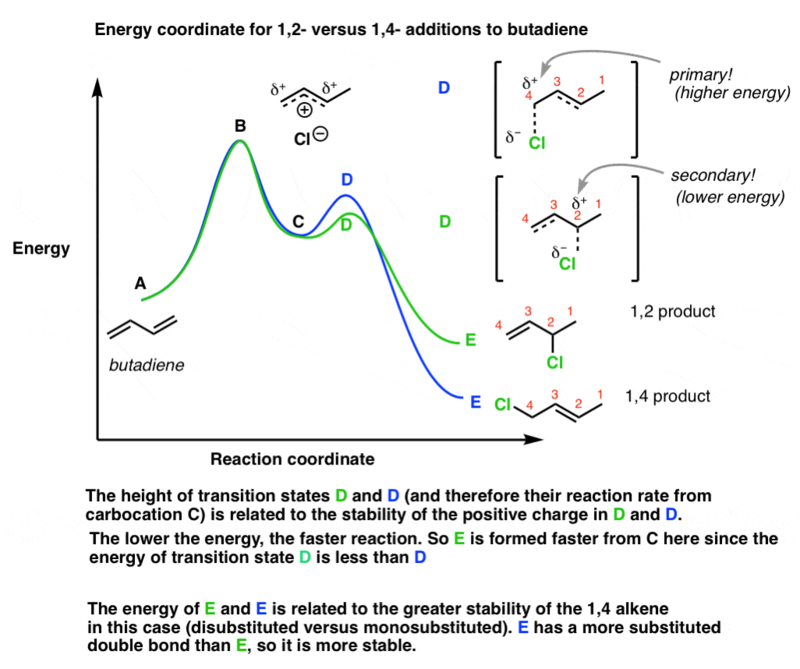 With butadiene, the addition of HCl leads to a resonance-stabilized carbocation. Note that the resonance form on the top bears the positive charge on the more substituted carbon, and will therefore have a higher contribution to the hybrid than the resonance form on the bottom, where the positive charge is borne by a primary carbon. In the attack of Cl– to the resonance stabilized carbocation, there are two possible sites of attack. In the transition state for attack at the carbon labelled C-2 [top] note that there is a partial double bond between C-3 and C-4, and that the positive charge is localized on C-2. In the transition state for attack at the carbon labelled C-4 [bottom] note that the partial double bond is between C-2 and C-3 and that positive charge is localized on C-4. 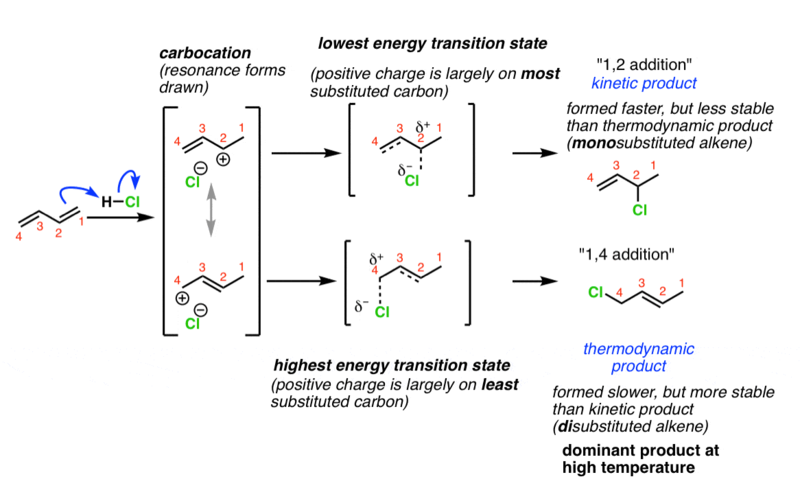 The top transition state will be lower in energy because in it, positive charge is localized on the most substituted carbon. Now look at the final products. The product of the top transition state [1,2 addition] has a mono substituted alkene (one carbon substituent) while the bottom transition state [1,4 addition] leads to a disubstituted alkene. Since alkene stability increases with the number of carbon substituents, the bottom product will be more thermodynamically stable. The reaction diagram looks like this. Each reaction begins with diene A, and then progresses through a transition state (B) to form resonance stabilized carbocation C. , which undergo attack through transition states D to give final products E. The height of each step in the process is related to its overall energy. When temperature is low, there is enough energy to form the 1,2-product – and that’s it. The product ratio is determined by the reaction rate (i.e. the height of the transition state D). Such a reaction is said to be under kinetic control. When temperature is high, there is enough energy to form both the 1,2- and the 1,4-products. Furthermore, the reaction to form products is reversible (i.e. there is enough energy to go from E → D and thence back to C. In this case the ratio of products is determined by the relative thermodynamic stabilities (i.e. the height of E). Such a reaction is said to be under thermodynanic control. So it’s a little bit like buying can openers. There’s a lower barrier for buying the cheapest one, but the more expensive one is often the more stable product overall. 1. 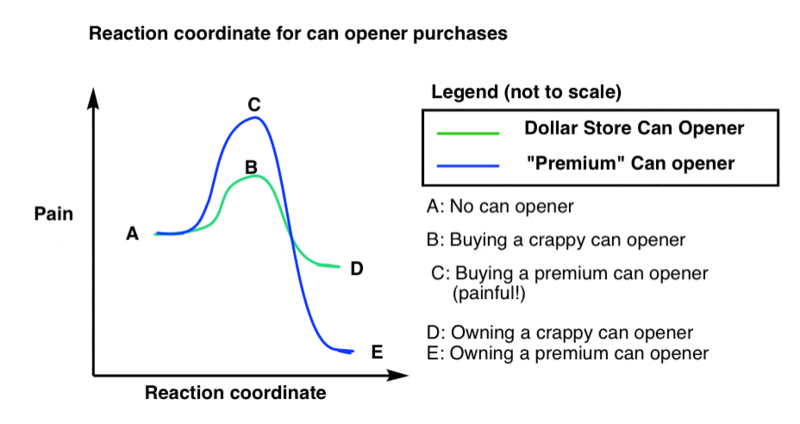 The can opener analogy doesn’t go into the “reversibility” part of things. However if you had a large population of people who had to make the identical decision, the population of people with deluxe/crappy can openers should likewise segment according to cost and reliability as a function of available resources. Note that if the product is too stable, nobody ever buys a replacement and the company goes out of business. That’s where planned obsolescence comes in. 2. Not all additions to dienes follow this pattern. It is important to be able to evaluate the relative carbocation stabilities and alkene substitution patterns independently for each given diene. Don’t automatically assume that the “1,4” product is always the most stable (try cyclopentadiene, for instance). For a good time, also try 2,5-dimethyl-2, 4 hexadiene. 3. When you buy an item from the dollar store with moving parts, caveat emptor. I’ll figure out a way! Although carbocation stability increases with substitution, isn’t a substituted allylic carbocation (the one formed in 1,2 addition) the most stable kind, even though it isn’t tertiary? Along the same lines, is an allyl carbocation more stable than a secondary carbocation even though it’s on a terminal carbon? Thanks! The long answer is: there are two factors at work here: increasing substitution, and resonance. In order to compare the relative effects of both factors, it’s necessary to examine experimental data. One example is to look at the rate of ionization of different alkyl and allyl halides, which is found in March’s Advanced Organic Chemistry – exact page reference escaping me at the moment, because my book is elsewhere. That data indicates that primary allylic carbocations are considerably more stable than secondary carbocations. Confused explanation… U gave 2 reasons for stability, both are confusing. The explanation that one carbocation is more stable than the other is misleading here. The two carbocations are resonance structures of each other – that means they are the same carbocation. Being the same species, they form at the same rate. If you used an unsymmetrical diene, say 1,3-pentadiene, then there would be two different carbocations that are not resonance structures, and the more stable carbocation would be favored, with the proton adding at carbon 1 forming carbcation with two secondary allylic resonance structures, rather than adding at carbon 4 to give the carbocation with one primary allylic and one secondary allylic resonance structure. The more stable carbocation can then go on to give both a 1,2- and a 1,4 product, but both products are formed from the same carbocation. The 1,2-product being the kinetic product is better explained in terms of a proximity effect, and the 1,4-product being more substituted and therefor more stable. hallelujah ! resonance structures are not different molecules. Thanks for the extra push, I do need to correct this. Fixed to reflect this. Thanks for the correction Pete. Is the activation energy during the formation of a thermodynamic product always greater than that of a kinetic product, and is a thermodynamic product always more stable than the kinetic product? Basically, can I ever find such a thing as a cheap can opener that’ll last? Please tell me where are the answers to the three questions in the post on reactions of dienes:1,2 and 1,4 addition?